As you’ll see, there’s not much to it. Shuttle already includes the motherboard and cables; it’s BYO processor, storage, and graphics. But those options alone can give you a lot of flexibility you don’t get from pre-built systems. We’ve talked a lot about options for gigging with computers on this site. Laptops remain the most portable alternative by far, of course, and they’ve gotten very powerful. As I noted for Macworld, the MacBook Pro can keep pace with even my dual-2.5GHz G5. So why have I suddenly shifted gears and built a desktop form factor PC? One major reason is the ability to have an upgradeable video card for gigs, which is why the story is on CDMotion rather than here. Sure, Apple will ship a competent ATI Radeon Mobility X1600, but you have to splurge on the Pro rather than the MacBook, there’s only one card with one output, and it’s not upgradeable. Price and upgradeability: Desktop machines still cost less at time of purchase, and (on the PC) even less over time thanks to upgradeable components. PCI expansion: Just as I wanted PCI slots for my video work, you might want to be able to move PCI-based audio cards and DSP cards out of your studio. There are some options, like the TC Electronic PowerCore’s mobile FireWire DSP hardware, which totes nicely with your laptop. But if you’ve invested in PCI cards, you might like a lightweight desktop that goes where you go. I still expect laptops will be the best option for most users, but small desktops remain an option worth considering, especially if you’re not allergic to Linux and Windows or if you already have a decent laptop and want a second machine. 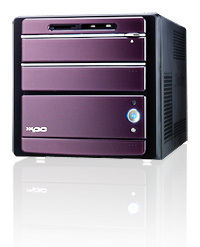 Now, what about small form factor (SFF) PCs versus rack-rig PCs and Macs, as covered previously? For me, it ultimately came down to a question of just how portable this rig was going to be. I need to be able to get on planes and trains with my setup, and a full rack is just way too much for a shrimpy guy with no car to lug. There’s also not much need for me to put stuff in a rack. Most of what I use runs in software, and keyboards are too long to fit. The Shuttles are really, really small — more on that, and how this setup fits in Shuttle’s custom carry-on luggage, coming soon. 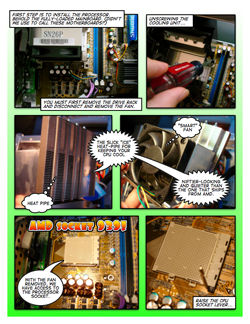 In the meantime, enjoy the assembly comic, and if you’ve never considered building a custom PC before, do let me know your impressions.